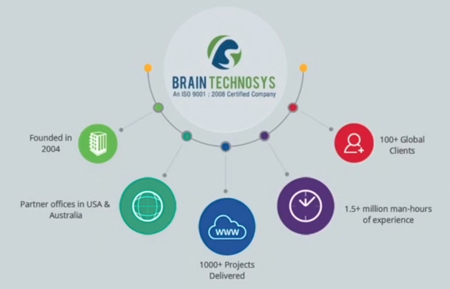 Brain Technosys is a leading mobile app development company offers the best mobile app development services and deliver the high quality mobile applications for our end-clients across variety of platforms. To provide quality apps development services, We use our expertise in the field of mobile app development. When it comes to app development, we focus on the high functionality with custom development. Our experienced mobile app developers are using their skills in CMS in order to produce mobile application designs which are not only based upon box ideas but included with high functionality as well. We design applications for a variety of system architectures on handheld devices. We develop and deliver effective solutions for iOS, android, Xamarin and Windows. We have an expert team strictly dedicated to conceptualize, deliver, and support mobile media solutions for start-ups and leading organization. We develop apps which function perfectly for both business owner and users. Our enterprise focused minds will ensure that your mobile app performs every function you require it to seamlessly whilst our strong dedication to design means that your users will experience the best of both worlds, outstanding functionality and beautiful composition. We create apps which help an organisation to promote their brand, improve customer satisfaction, generate revenue and find new business opportunities. The objective is to provide comprehensive mobile app development whilst providing delightful user experience and increased ROI for your business. We deliver a user-friendly and engaging iOS apps that will attract new customers and retain existing ones. To develop a successful Android app, the first thing we put is the clear concept that can define the apps feature. We develop hybrid apps that will help you reach customers across platforms without compromising on user experience. We are having our expert team to provide you satisfactory Xamarin app development services as per your requirement. We thrive on helping our clients turn their inventive concepts into games, whilst taking away all the hurdles. Enhance the visibility of your mobile apps with our innovative mobile app promotion services.